2018-07-09 Assigned to 3M INNOVATIVE PROPERTIES COMPANY reassignment 3M INNOVATIVE PROPERTIES COMPANY ASSIGNMENT OF ASSIGNORS INTEREST (SEE DOCUMENT FOR DETAILS). Assignors: JING, NAIYONG, JUERGENS, MICHAEL, BLONG, THOMAS J., FLETCHER, TIMOTHY D., HAMER, KEVIN M., YU, ZHIGANG, LOCHHAAS, KAI H.
A fluoropolymer coating composition is described comprising an aqueous liquid medium, fluoropolymer particles dispersed in the aqueous liquid medium, and at least one aziridine compound. The aziridine compound comprises at least two aziridine groups (i.e. polyaziridine) or at least one aziridine group and at least one alkoxy silane group. In another embodiment, an article is described comprising a substrate wherein a surface of the substrate comprises a coating comprising fluoropolymer particles; and a reaction product of at least one aziridine compound comprising at least two aziridine groups or at least one aziridine group and at least one alkoxy silane group. The coating can be utilized as a primer for bonding a non-fluorinated substrate to a fluoropolymer film and/or the coating can be used as an (e.g. outer exposed) surface layer. In some embodiments, the article may be the (e.g. backside) film of a photovoltaic module. This application is a divisional application of U.S. patent application Ser. No. 14/911,852, filed Feb. 12, 2016, which is a national stage filing under 35 U.S.C. 371 of PCT/CN013/086680, filed Nov. 7, 2013, the disclosures of which are incorporated herein by reference. In one embodiment, a fluoropolymer coating composition is described comprising an aqueous liquid medium, fluoropolymer particles dispersed in the aqueous liquid medium, and at least one aziridine compound. The aziridine compound comprises at least two aziridine groups (i.e. polyaziridine) or at least one aziridine group and at least one alkoxy silane group. The following definitions apply throughout the specification and claims. The term “aqueous” means that the liquid of the coating contains at least 50, 60, 70, or 80 percent by weight of water. It may contain a higher amount of water such as, for example, at least 85, 90, 95, or even at least 99 percent by weight of water or more. The aqueous liquid medium may comprise a mixture of water and one or more water-soluble organic cosolvent(s), in amounts such that the aqueous liquid medium forms a single phase. Examples of water-soluble organic cosolvents include methanol, ethanol, isopropanol, 2-methoxyethanol, 3-methoxypropanol, 1-methoxy-2-propanol, tetrahydrofuran, and ketone or ester solvents. The amount of organic cosolvent typically does not exceed 50, 40, 30, 20, or 15 wt.-% of the total liquids of the coating composition. The aqueous fluoropolymer coating composition described herein typically comprises at least 15 wt-% and typically no greater than about 80 wt-% aqueous liquid medium. In some embodiments, the aqueous fluoropolymer coating comprises no greater than 70 wt.-%, 60 wt.-%, 50 wt.-%, or 40 wt.-% aqueous liquid medium. The term “nanoparticles” refers to particles with an average particle size of less than or equal to about 100 nanometers (nm). A “dried” coating is a coating that has been applied from a coating composition that includes a liquid carrier (i.e. water and optionally cosolvent), and the liquid carrier has been substantially completely removed, for example by evaporation. A dried coating may also be cured (i.e., crosslinked) as a result of reaction between the reactive functional groups of the fluoropolymer and the aziridine compound, for example during evaporation. The rate and degree of curing can typically be enhanced by heating the coating composition during or after the drying process. The term “liquid” means liquid at a temperature of 25° C. and a pressure of 1 atm. The aqueous coating composition described herein comprises at least one fluoropolymer. and partially or fully fluorinated vinyl ethers. The polymerization may further comprise non-fluorinated monomers such as ethylene, propylene, and non-fluorinated vinyl ethers. wherein Rf and R′f are different linear or branched perfluoroalkylene groups of 2-6 carbon atoms, m and n are independently 0-10, and R″f is a perfluoroalkyl group of 1-6 carbon atoms. Examples of perfluorovinyl ethers according to the above formulas include perfluoro-2-propoxypropylvinyl ether (PPVE-2), perfluoro-3-methoxy-n-propylvinyl ether, perfluoro-2-methoxy-ethylvinyl ether, perfluoromethylvinyl ether (PMVE), perfluoro-n-propylvinyl ether (PPVE-1) and CF3—(CF2)2—O—CF(CF3)—CF2—O—CF(CF3)—CF2—O—CF═CF2. wherein Rf represents a perfluorinated aliphatic group that may contain one or more oxygen atoms. The fluorine content of the fluoropolymer is typically at least 60, 65, 66, 67, 68, 69, or 70 wt-% of the fluoropolymer and typically no greater than 77 wt-%. In some embodiments, the coating composition comprises one or more fluoropolymers in the absence of non-fluorinated polymeric binders. In such embodiments, the non-solvent organic portion of the coating composition (i.e. of the total non-aqueous composition except for the inorganic nanoparticles) also has a fluorine content in the range just described. However, the fluorine content of the organic portion is slightly lower than that of the fluoropolymer(s) due to the inclusion of the aziridine compound. The aqueous fluoropolymer coating composition preferably comprises a waterborne fluoropolymer, e.g. a fluoropolymer derived from an aqueous emulsion polymerization of at least one fluorinated monomer and an initiator as described for example in US2011/0034604; incorporated herein by reference. Waterborne fluoropolymers typically comprise small concentrations of polar functional groups including hydroxyl and carboxylate groups. For example, the uses of sulfinates, such as ammonium perfluorobutyl sulfinate, as part of the initiator system can produce such polar groups. In some embodiments, the fluoropolymer comprises at least about 0.01, 0.02, 0.03, 0.04, or 0.05 up to 0.1 mole % of polar functional groups including hydroxyl and/or carboxylate groups. Such hydroxyl and/or carboxylate groups are surmised to crosslink with aziridine groups of the polyaziridine compound. The coating composition comprises an aqueous fluoropolymer latex dispersion of one type of fluoropolymer or a blend of the various fluoropolymers as described herein. In some embodiments, the fluoropolymer is a homopolymer of a fluorinated monomer such as polytetrafluoroethylene. In other embodiments, the fluoropolymers is a copolymer of two or more fluorinated monomers. In yet other embodiments, the fluoropolymer is a copolymer of one or more fluorinated monomers and at least one non-fluorinated monomer. For example, the fluoropolymer may be a copolymer of TFE and ethylene; or a copolymer of TFE, hexafluoropropylene (HFP), and ethylene. In some embodiments, the coating composition comprises or consists of fluoropolymer(s) having monomeric (e.g. repeat) units derived from TFE and/or CTFE and monomeric units derived from non-fluorinated or fluorinated vinyl ethers. In some embodiments, the molar amount of TFE and/or CTFE is at least 55, 60, 65, or 70 mole % of the fluoropolymer. Fluoropolymers of this type may be substantially free of monomeric units derived from vinyl fluoride (VF) and/or vinylidene fluoride (VDF, VF2). In some embodiments, the fluoropolymer of the coating composition comprises at least 5, 10, 15, 20, 25, 30, or 35 mole % of monomeric units derived from a non-fluorinated vinyl ether monomer. A commercially available fluoropolymer of this type is a water-based fluoroethylene vinyl ether copolymer available from Zhenbang Co. (Dalian, China) under the trade designation “Lumiflon ZBF500-1”. In some embodiments, fluoropolymers useful in the present invention comprise monomeric (e.g. repeat) units derived from vinyl fluoride (VF) and/or vinylidene fluoride (VDF, VF2). In some embodiments, the fluoropolymer is a homopolymer derived from VF and/or vinylidene fluoride. In other embodiments, the fluoropolymer is a copolymer of VF and/or VDF and at least one other comonomer. wherein x, y and z are expressed as molar percentages. For some embodied thermoplastic fluoropolymers, x (i.e. TFE) is greater than zero and typically at least 20, 25, or 30 molar percent of the fluoropolymer. In some embodiments, x is no greater than 60 or 55. In other embodiments, x is not greater than 50 mole %. The molar amount of y (i.e. HFP) is typically at least 5, 6, 7, 8, 9, or 10 and less than about 15 molar percent. In some embodiments, the molar amount of z (i.e. VDF) is at least 30 or 35 and typically no greater than 60. In some embodiments, y is no greater than 50. In some embodiments, the coating composition comprises fluoropolymer(s) having monomer (e.g. repeat) units derived from tetrafluoroethylene (“TFE”), hexafluoropropylene (HFP), and vinylidene fluoride (VDF, VF2). Examples of such commercially available fluoropolymers are available from 3M under the trade name Dyneon™ Fluoroplastic THV™ 200; Dyneon™ Fluoroplastic THV™ 300; Dyneon™ Fluoroplastic THV™ 400; Dyneon™ Fluoroplastic THV™ 500; and Dyneon™ Fluoroplastic THV™ 800 described in U.S. Pat. No. 7,323,514. In other embodiments, the fluoropolymer is formed from the monomers vinyl fluoride (VF) and/or vinylidene fluoride (“VDF,” “VF2,”) such that the amount is greater than 55, 60, 65, or 70 mole % of the fluoropolymer. Representative fluoropolymer of this type are commercially available from Arkema Inc. Philadelphia, Pa. under the trade designation. In some embodiments, the fluoropolymers lack reactive functionality (i.e. other than carboxylate or hydroxyl functionality) derived from inclusion of a cure-site monomer. In other embodiments, the fluoropolymers comprise reactive functionality derived from inclusion of a cure-site monomer. The aqueous emulsion polymerization of the fluoropolymer may involve comonomers that have a functional group such as for example a group capable of participating in a peroxide cure reaction. Such functional groups include halogens such as Br or I.
wherein each X independently represents H or F, Z′ is Br or I, Rf is a perfluoroalkylene C1-C12, optionally containing chlorine atoms and r is 0 or 1; for instance: bromotrifluoroethylene, 4-bromo-perfluorobutene-1, and the like; or bromofluoroolefins such as 1-bromo-2,2-difluoroethylene and 4-bromo-3,3,4,4-tetrafluorobutene-1. The aqueous emulsion polymerization of the fluoropolymer may involve comonomers that have a functional group. 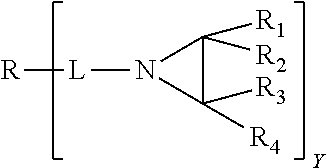 Nitrile groups can be “cured” by catalyzing trimerization to triazines. wherein L represents an integer of 2 to 12; g represents an integer of 0 to 4; k represents 1 or 2; v represents an integer of 0 to 6; u represents an integer of 1 to 6, Rf is a perfluoroalkylene or a bivalent perfluoroether group. Specific examples of nitrile containing liquid fluorinated monomers include perfluoro(8-cyano-5-methyl-3,6-dioxa-1-octene), CF2═CFO(CF2)5CN, and CF2═CFO(CF2)3OCF(CF3)CN. In some embodiments, the fluoropolymer may involve comonomers that have a (e.g. halogen) functional group capable of being crosslinked by a multi-(meth)acrylate compound, such as described in U.S. Pat. No. 7,323,514. The multi-(meth)acrylate crosslinker typically comprises at least two (meth)acrylate groups. Representative compound include the same multi-(meth)acrylate compound that can be used for the preparation of the polyaziridine compound by Michael addition as will subsequently be described. The aqueous emulsion polymerization may be used to produce a variety of fluoropolymers including perfluoropolymers, which have a fully fluorinated backbone, as well as partially fluorinated fluoropolymers. The aqueous emulsion polymerization may result in melt-processible fluoropolymers as well as those that are not easily melt-processible such as for example polytetrafluoroethylene and so-called modified polytetrafluoroethylene. The polymerization process can further yield fluoropolymers that can be cured to make fluoroelastomers as well as fluorothermoplasts. Fluorothermoplasts are generally fluoropolymers that have a distinct and well noticeable melting point, typically in the range of 60 to 320° C. or between 100 and 320° C. Thus, they have a substantial crystalline phase. Fluoropolymers that are used for making fluoroelastomers typically are amorphous and/or have a negligible amount of crystallinity such that no or hardly any melting point is discernible for these fluoropolymers. The glass transition temperature (Tg) of commercially available fluoropolymer elastomers typically ranges from room temperature to about −40° C.
In some embodiments, the thermoplastic fluoropolymers have a melt temperature ranging from about 200° C. to about 280° C., 290° C., 300° C., or 325° C. In this embodiment, the melt temperature can be at least 210° C., 215° C., 220° C., or 225° C. In other embodiments, the melt temperature ranges from about 110° C. to about 180° C. In this embodiment, the melt temperature can be at least than 125° C., 130° C., 135° C. or 140° C. The melt temperature of the fluoropolymer is related to the temperature at which the dried coating can be heat laminated to another thermoplastic material, such as an (e.g. EVA) encapsulant and/or (e.g. PET) polymeric substrate film (e.g. of a photovoltaic cell). In some embodiments, a fluoropolymer having a melt temperature less than 130° C., or 125° C., or 120° C. is blended with a fluoropolymer having a melt temperature greater than 130° C., 140° C., 150° C., 160° C. In other embodiments, a fluoropolymer having a melt temperature less than 130° C., or 125° C., or 120° C. is blended with a fluoropolymer having a melt temperature greater than 200° C., 250° C., 275° C., or 300° C. Such blends can provide a relatively low heat lamination temperature in combination with good mechanical properties and durability. The fluoropolymer dispersed in the aqueous diluent is a film-forming polymer. Suitable polymer latexes and methods for making them are widely known in the art, and many are commercially available. Typically, although not necessary, the particles in the fluoropolymer latexes are substantially spherical in shape. The polymer core may comprise one or more water-insoluble polymers, although this is not a requirement. Useful polymer particle sizes include those typical of latexes and other dispersions or emulsions. Typical polymer particle sizes are in a range of from about 0.01 micrometers (10 nm) to 100 micrometers. In some embodiments, the average particle size is at least 20, 30, 40, 50, or 60 nm. In some embodiments, the average particle size of the fluoropolymer is no greater than 300, 250, 200, 100 or 75 nanometers. Particles in the range from about 1 nm to 100 nm are often termed “nanoparticles” while those from about 200 nm (0.2 micrometers) up to about 2 micrometers are often termed “microparticles”. However, many polymer latexes are of sizes intermediate between these ranges, e.g. from about 50 nm to about 500 nm. In some embodiments, the coating composition (e.g. useful as a primer) is free of inorganic nanoparticles or comprises a relatively small concentration of inorganic nanoparticles (e.g. as a thickener). In this embodiment, the total concentration of fluoropolymers can be at least 90, 91, 92, 93, 94, 95, 96, 97, 98, or 99 wt-% solids of the total weight of the dried coating composition. In other embodiments, the coating composition (e.g. useful for a backside coating of a photovoltaic module or a surface coating of an optical display device) comprises one or more fluoropolymers, one or more aziridine compounds (reaction products thereof), and a higher concentration of inorganic nanoparticles. In such embodiments, the coating composition may comprise less than 90 wt-% solid of fluoropolymer(s). As the concentration of nanoparticles increases, the concentration of fluoropolymer decreases. The fluoropolymer coating composition typically comprises one or more fluoropolymers in an amount of at least 15, 16, 17, 18, 19, or 20 wt-% solids of the dried coating composition. In some embodiments, the amount of fluoropolymer is at least 20, 25, or 30 wt-% and in some embodiments at least 35 or 40 wt-% of the dried coating composition. In some embodiments, the amount of fluoropolymer is no greater than 80, 70, or 60 wt-% of the dried coating composition. In some embodiments, the fluoropolymer coating composition comprises one or more aziridine compounds typically present in a total amount of at least 0.1, 0.2, 0.3, 0.4, or 0.5 wt-% up to 1, 2 or 3 wt-% solids of the coating composition. The dried fluoropolymer coating comprises a reaction product of such aziridine compound(s). 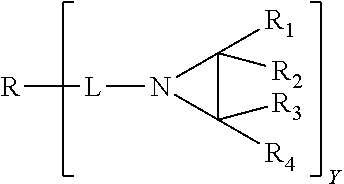 Such reaction product generally comprises a ring-opened aziridine linkage, otherwise known as an amide linkage, characterized by the presence of a —NH. At such low concentrations, any crosslinking that does occur between functional groups of the fluoropolymer and the aziridine compound typically does not result in an appreciable improvement in mechanical properties. However, such low concentrations can provide a substantial improvement in adhesion, especially to polymeric substrates, such as PET. In other embodiments, a higher concentration of aziridine compound is utilized. For example, the concentration of aziridine compound or reaction product thereof can range up to 5, 10, 15, 20, 25 or 30 wt-% of the solids of the coating composition. Higher concentrations are typically utilized for embodiments wherein higher concentrations of inorganic nanoparticles are utilized and an aziridine compound is utilized that can react with the inorganic nanoparticles. For example, the alkoxy silane groups of an aziridine alkoxy silane compound can react with hydroxyl groups present on the inorganic nanoparticles; while the aziridine group can improve adhesion with the substrate. In some embodiments, a combination of at least one aziridine compound that comprises at least two aziridine groups and at least one aziridine alkoxy silane compound is utilized at a weight ration of 1:4 to 4:1 or 1:3 to 3:1 or 1:2 to 2:1 or about 1:1. Y is typically 2, 3, or greater. In some embodiments, R is —SO2—. 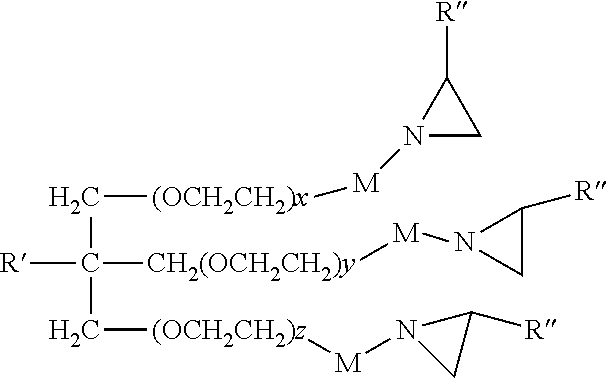 In some embodiments, R-L is a residue of a multi(meth)acrylate compound. In some embodiments L is a C1-C4 alkylene, optionally substituted with one or more (e.g. contiguous or pendant) oxygen atoms thereby forming ether or ester linkages. In typical embodiments, R1 is methyl and R2, R3, and R4 are hydrogen. Representative aziridine compounds include trimethylolpropane tri-[beta-(N-aziridinyl)-propionate, 2,2-bishydroxymethyl butanoltris[3-(1-aziridine)propionate]; 1-(aziridin-2-yl)-2-oxabut-3-ene; and 4-(aziridin-2-yl)-but-1-ene; and 5-(aziridin-2-yl)-pent-1-ene. The synthesis of this compound is described in No. 61/901,016, titled “FLUROPOLYMER COATINGS COMPRISING AZIRIDINE COMPOUND AND NON-FLUORINATED POLYMER” cofiled Nov. 7, 2013. In some embodiments the polyaziridine compound may comprise alkylene oxide repeat units, such as ethylene oxide repeat units. The number of alkylene oxide (e.g. ethylene oxide) repeats units is typically at least 2 or 3 and typically no greater than about 20. In some embodiments, the number of alkylene oxide (e.g. ethylene oxide) repeat units averages about 6, 7, 8, or 9. One representative of this type is as follows. M is a bond, divalent atom, or divalent linking group. In some embodiments, the sum of x+y+z is at least 3, 4, 5, or 6. Further the sum of x+y+z is typically no greater than 20. In some embodiments, M is a covalent bond or a C1-C4 alkylene. Other polyaziridine compounds comprising alkylene oxide repeat units are described in U.S. Pat. No. 8,017,666; incorporated herein by reference. 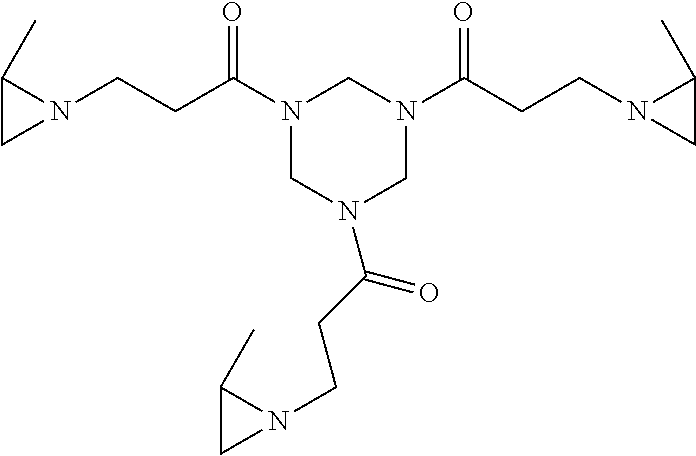 The above described polyaziridine compounds comprise at least two aziridine groups at the time the compound is added to the coating composition. In other embodiments, the polyaziridine compound does not comprise two aziridine groups at the time the compound is added to the coating composition, yet forms a polyaziridine in-situ. For example, compounds comprising a single aziridine group and a single (meth)acrylate group can form a dimer or oligomerize by reaction of the (meth)acrylate groups thereby forming a polyazirdine (i.e. diaziridine) compound. the sum of n+m is 3. One representative compound is 3-(2-methylaziridinyl)ethylcarboxylpropyltriethoxysilane. In some embodiments, the coating composition is free of inorganic nanoparticles. In other embodiments, the coating composition comprises inorganic nanoparticles. The inorganic oxide particles are nanoparticles, typically having an average primary or agglomerate particle size diameter of at least 1, 2, 3, 4, or 5 nanometers and typically no greater than 80, 90, 100, or 200 nanometers. The average particle size of the nanoparticles of the cured coating can be measured using transmission electron microscopy. The average particle size of the nanoparticles of the coating solution can be measured using dynamic light scattering. “Agglomerate” refers to a weak association between primary particles which may be held together by charge or polarity and can be physically broken down into smaller entities. “Primary particle size” refers to the mean diameter of a single (non-aggregate, non-agglomerate) particle. Unlike fumed silica that comprises silica aggregates, in favored embodiments the nanoparticles utilized herein comprise a substantial concentration of discrete unaggregated nanoparticles. As used herein “aggregate” with respect to particles refers to strongly bonded or fused particles where the resulting external surface area may be significantly smaller than the sum of calculated surface areas of the individual components. The forces holding an aggregate together are strong forces, for example covalent bonds, or those resulting from sintering or complex physical entanglement. Although agglomerated nanoparticles can be broken down into smaller entities such as discrete primary particles such as by application of a surface treatment; the application of a surface treatment to an aggregate simply results in a surface treated aggregate. In some embodiments, a majority of the nanoparticles (i.e. at least 50%) are present as discrete unagglomerated nanoparticles. For example, at least 70%, 80% or 90% of the nanoparticles are present as discrete unagglomerated nanoparticles. Preferably, the nanoparticles comprise silica. Nanoparticles can include essentially only silica (although other oxides can be used, such as ZrO2, colloidal zirconia, Al2O3, colloidal alumina, CeO2, colloidal ceria, SnO2, colloidal tin (stannic) oxide, TiO2, colloidal titanium dioxide), or they can be composite nanoparticles such as core-shell nanoparticles. A core-shell nanoparticle can include a core of an oxide (e.g., iron oxide) or metal (e.g., gold or silver) of one type and a shell of silica deposited on the core. Herein, “silica nanoparticles” refer to nanoparticles that include only silica as well as core-shell nanoparticles with a surface that includes silica. The coatability of the aqueous coating composition can be improved by inclusion of a small concentration of inorganic nanoparticles such as silica or clay that functions, at least in part, as a thickener. In this embodiment, the coating composition may contain 1, 2, 3, 4, or 5 wt-% of inorganic oxide nanoparticles. In order to improve mechanical properties, such as abrasion resistance and pencil hardness, the concentration of (e.g. silica) inorganic nanoparticles is typically at least 5, 6, 7, 8, 9, or 10 wt-% solids of the dried coating composition. In some embodiments, the dried coating compositions comprises at least 11, 12, 13, 14 or 15 wt-% of (e.g. silica) inorganic nanoparticles. In some embodiments, the dried coating compositions comprises no greater than 60, 55, 50, 45 or 40 wt-% of (e.g. silica) inorganic nanoparticles. The nanoparticles are typically relatively uniform in size. The variability in the size of the nanoparticles is typically less than 25 percent of the mean particle size. In some embodiments the (e.g. silica) nanoparticles have a relatively small average particle size. For example, the average primary or agglomerate particle size may be less than 75 nm, 50 nm, or 25 nm and in some embodiments, less than 20 nm, 15 or 10 nm. When such smaller nanoparticles are employed, it is typically preferred that such nanoparticles are surface modified with a hydrophilic surface treatment such as 3-glycidoxylpropyl trimethoxy silane. Alternatively, the nanoparticles can be surface modified with other hydrophilic organosilane surface treatment (e.g. lacking a longer chain alkyl group having 4 or more carbon atoms) that typically comprise other hydrophilic groups such as alkylene oxide groups, acids and salts, as well as hydroxyl groups. Suitable hydrophilic surface treatments include poly(ethyleneoxide)/poly(propyleneoxide) trialkoxysilane, sulfonato-organosilanols, also called organosilanol-sulfonic acids/salts having chemical structures such as described in U.S. Pat. Nos. 4,338,377 and 4,152,165. Representative surface treatments include NaOSi(OH)2(CH2)3SO3Na, (OH)3Si(CH2)3OCH2CH(OH)CH2SO3H, 3-hydroxyl propyl trimethoxysilane, (HO)3SiCH2CH2COOH and its carboxylate silane. Since the coating compositions are not subjected to photocrosslinking, the (e.g. silica) nanoparticles typically do not comprise a surface treatment having a vinyl or (meth)acrylate moiety. In the absence of surface modification of such relatively small nanoparticles, the coating can exhibit short solution shelf-life time. However, when the (e.g. silica) inorganic oxide nanoparticles have an average particle size of greater than 20 nm, the nanoparticles do not require surface modification to provide useful solution stability. Thus the nanoparticles are “unmodified nanoparticles” since the nanoparticles do not comprise a surface treatment. It is appreciated however, that unmodified silica nanoparticles commonly comprise hydroxyl or silanol functional groups on the nanoparticle surface, particularly when the nanoparticles are provided in the form of an aqueous dispersion. Further, the larger nanoparticles can optionally be surface modified with the hydrophilic surface treatments previously described. Inorganic silica sols in aqueous media are well known in the art and available commercially. Silica sols in water or water-alcohol solutions are available commercially under such trade names as LUDOX (manufactured by E.I. duPont de Nemours and Co., Inc., Wilmington, Del. ), NYACOL (available from Nyacol Co., Ashland, Mass.) or NALCO (manufactured by Nalco Chemical Co., Oak Brook, Ill.). Some useful silica sols are NALCO 1115, 2326, 1050, 2327, and 2329 available as silica sols with mean particle sizes of 4 nanometers (nm) to 77 nm. Another useful silica sol is NALCO 1034a available as a silica sol with mean particle size of 20 nanometers. Another useful silica sol is NALCO 2326 available as a silica sol with mean particle size of 5 nanometers. Additional examples of suitable colloidal silicas are described in U.S. Pat. No. 5,126,394. Siliceous nanoparticles (that include silica nanoparticles) are also available from Southern Clay Product Inc., Gonzales, Tex. In some embodiments, the silica nanoparticles used in coating compositions are acicular. The term “acicular” refers to the general elongated shape of the particles and may include other string-like, rod-like, chain-like shapes, as well as filamentary shapes. The acicular colloidal silica particles may have a uniform thickness of 5 to 25 nm, a length, Di, of 40 to 500 nm (as measured by dynamic light-scattering method) and a degree of elongation D1/D2 of 5 to 30, wherein D2 means a diameter in nm calculated by the equation D2=2720/S and S means specific surface area in m2/g of the particle, as is disclosed in the specification of U.S. Pat. No. 5,221,497. U.S. Pat. No. 5,221,497 discloses a method for producing acicular silica nanoparticles by adding water-soluble calcium salt, magnesium salt or mixtures thereof to an aqueous colloidal solution of active silicic acid or acidic silica sol having a mean particle diameter of 3 to 30 nm in an amount of 0.15 to 1.00 weight percent based on CaO, MgO or both to silica, then adding an alkali metal hydroxide so that the molar ratio of SiO2/M2O (M:alkali metal atom) becomes 20 to 300, and heating the obtained liquid at 60 to 300 degrees centigrade for 0.5 to 40 hours. The colloidal silica particles obtained by this method are elongate-shaped silica particles that have elongations of a uniform thickness within the range of 5 to 40 nm extending in only one plane. Acicular silica sol may also be prepared as described in U.S. Pat. No. 5,597,512. Useful acicular silica particles may be obtained as an aqueous suspension under the trade name SNOWTEX-UP by Nissan Chemical Industries (Tokyo, Japan). The mixture consists of 20-21 percent (w/w) of acicular silica, less than 0.35 percent (w/w) of Na2O, and water. The particles are 9 to 15 nanometers in diameter and have lengths of 40 to 300 nanometers. The suspension has a viscosity of less than 100 mPas at 25 Degrees centigrade a pH of 9 to 10.5, and a specific gravity of 1.13 at 20 degrees centigrade. The silica sols used in the present disclosure generally can include counter cations, in order to balance the surface charge of the colloids. Examples of cations suitable for use as counter ions for negatively charged colloids include Na+, K+, Li+, a quaternary ammonium cation such as NR4 +, wherein each R can be any monovalent moiety, but is preferably H or lower alkyl, such as —CH3, combinations of these, and the like. The method of making the coating entails providing an aqueous fluoropolymer latex dispersion (comprising fluoropolymer particles). When the dispersion is neutral or acidic, the method further comprises adjusting the pH of the mixture to be sufficiently basic, such as by addition of ammonia. The aqueous liquid medium preferably is basic, having a pH of at least 8 and typically no greater than 10, 10.5, 11, 11.5 or 12. The method further comprises adding at least one aziridine compound to the basic aqueous liquid medium. When the coating further comprises inorganic oxide nanoparticles, the inorganic oxide nanoparticles are typically also provided as an aqueous dispersion and may be added prior to adjusting the pH and prior to adding the aziridine compound. Although the coating composition comprises water as the primary liquid component, in some embodiments, the coating composition may optionally comprise a small amount of an organic cosolvent. For example, organic cosolvents may be present in the commercially available aqueous dispersions of the fluoropolymer latex and/or inorganic oxide nanoparticles. The concentration of the organic cosolvent is typically no greater than 15 wt-% of the total liquids of the coating composition. In some embodiments, the organic cosolvent is no greater than 10 or 5 wt-% of the total liquids of the coating composition. The coating composition may optionally comprise various additives as known in the art including for example thickeners (such as clay available from Southern Clay Product Inc., Gonzales, Tex., under the trade designation “LAPRD”), surfactants, pigments including TiO2 or carbon black, fillers, as well as one or more light stabilizers. Light stabilizer additives include ultraviolet absorbing compounds such as hydroxybenzophenones and hydroxybenzotriazoles. Other light stabilizer additives include hindered amine light stabilizers (HALS) and antioxidants. Thermal stabilizers can also be used if desired. When the coating lacks an inorganic nanoparticle thickener, the coating typically comprises a surfactant. Various surfactant suitable for fluoropolymer coatings are known, such as described in previously cited US2011/0034604. In one embodiment, the coating comprises an ionic surfactant such as a sodium alpha olefin sulfonates, commercially available from Stepan Company under the trade designation “A-18”. The coating composition may optionally comprise a non-fluorinated polymer (e.g. polymer binder), such as a polyurethane or acrylic polymer, in an amount up to about 5 or 10 wt-%. When present, the polymeric binder is typically present as discrete particles. Since the fluoropolymer and polymeric binder are not soluble in or swelled by the aqueous liquid medium, both the fluoropolymer and non-fluorinated polymer are generally present in particle form as can be determined by transmission electron microscopy. Hence, the fluoropolymer and non-fluorinated polymer typically do not form a continuous phase interpenetrating network. The fluoropolymer and non-fluorinated polymer can form a chemical network by reaction of the aziridine groups of a polyaziridine with the carboxylic groups of the fluoropolymer latex and non-fluorinated polymer latex. However, good adhesion, especially to polymeric substrates, such as PET, can be obtained in the absence of polymeric binder due to the improvement in adhesion provided by the aziridine compound. Hence, in typical embodiments, the coating composition is free of non-fluorinated polymer. A non-fluorinated polymer can typically be distinguished from non-fluorinated monomeric units of the fluoropolymer by chain length and linkage type. In some embodiments, the coating composition is typically substantially free of olefin units having a chain length greater than 20 carbon atoms. Further, non-fluorinated polymers typically have other linking groups that are not present in fluoropolymers. For example, a polyurethane polymer comprises urethane linkages; whereas an acrylic polymer comprise a carbonyl adjacent an ether linkage (e.g. 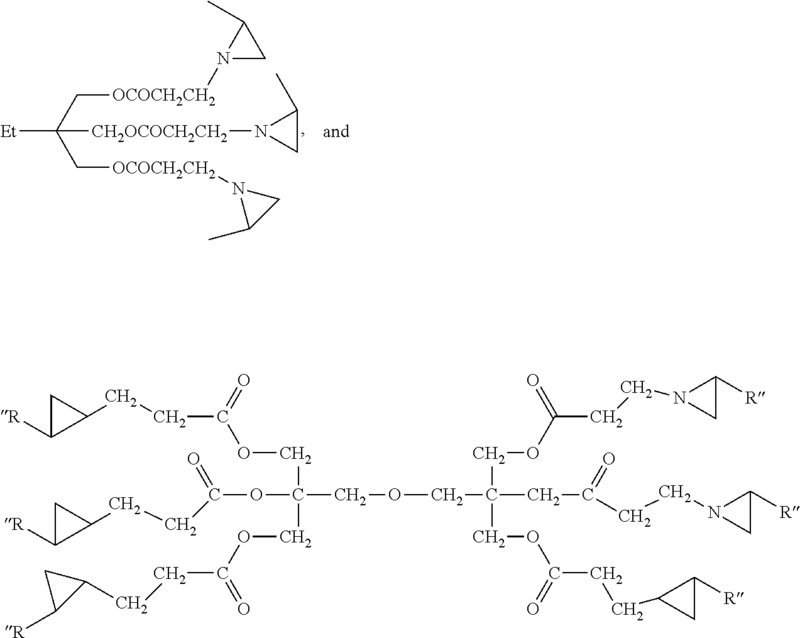 acrylic acid alkyl ester linkages). Thus, when the coating composition is free of non-fluorinated polymer, the coating is typically free of polymers having heteroatoms such as oxygen and nitrogen that are characteristic of such polymers. In one embodiment, the fluoropolymer coating composition includes barrier particles, such as described in U.S. Pat. No. 8,025,928. Such particles are platelet-shaped particles. Such particles tend to align during application of the coating and, since water, solvent and gases such as oxygen cannot pass readily through the particles themselves, a mechanical barrier is formed in the resulting coating which reduces permeation of water, solvent and gases. In a photovoltaic module, for example, the barrier particles substantially increase the moisture barrier properties of the fluoropolymer and enhance the protection provided to the solar cells. Barrier particles can be in amount from about 0.5 to about 10% by weight based on the total dry weight of the fluoropolymer composition in the coating. Examples of typical platelet shaped filler particles include clay, mica, glass flake and stainless steel flake, and aluminum flake. In one embodiment, the platelet shaped particles are mica particles, including mica particles coated with an oxide layer such as iron or titanium oxide. In some embodiments, these particles have an average particle size of about 10 to 200 microns in more specific embodiments 20 to 100 microns with no more than 50% of the particles of flake having average particle size of more than about 300 microns. The fluoropolymer coating described herein can be used to prepare a coated substrate wherein a surface of the substrate comprises the dried coating composition. In some embodiments, the substrate may be an inorganic substrate, such as glass, or polymeric substrate. In other embodiments, the substrate is a polymeric substrate. Polymeric substrates can be made of polyester (e.g., polyethylene terephthalate (PET), polybutylene terephthalate), polycarbonate (PC), allyldiglycolcarbonate, polyacrylates such as polymethylmethacrylate, polystyrene, polysulfone, polyethersulfone, cellulose acetate butyrate, polyolefin, PVC, polyamide, polyurethane, polyimide, polyurea, and the like, including blends and laminates thereof. In some embodiments, the substrate is a planar substrate such as a panel or film substrate. The thickness of the substrate can vary, but typically ranges from about 2 mils to about 30 mils. In some embodiments, the substrate is light transmissive, having light transmission between at least 300 nm to 1200 nm. The surface of the (e.g. polymeric) substrate which is to be coated may be surface treated to improve adhesion such as by electrical discharge such as corona treatment or by atmospheric nitrogen plasma treatment. However, the coating composition described herein has been found to exhibit good adhesion to polymer (e.g. polyester) substrates and other fluoropolymer coatings and films in the absence of such surface treatment. The aqueous fluoropolymer coating compositions for making the fluoropolymer coated film can be applied as a liquid directly to suitable (e.g. polymeric) substrate films by conventional coating means such as spray, roll, knife, curtain, gravure coaters, or any other method that permits the application of a relatively uniform coating. In some embodiments, the primer coating thickness of the dried coating is between about 2.5 microns (0.1 mil) and about 25 microns (1 mil). In some embodiments, the dried coating has a thickness no greater than 20 microns, or 15 microns, or 10 microns. In some embodiments, the coating thickness of an exposed outer surface layer (e.g. backside of photovoltaic module) is the same thickness of the primer. In other embodiments, the coating thickness ranges up to 250 microns (10 mils). A single coating or multiple coatings can be applied to obtain the desired thickness. After application, the water (and optional cosolvent) is removed, and the fluoropolymer coating is adhered to the (e.g. polymeric) substrate (e.g. film). In some embodiments the coating compositions can be coated onto the substrate and allowed to air dry at ambient temperatures. Although not necessary to produce a coalesced film, heating is generally desirable for crosslinking and to dry the coating more quickly. The coated substrate can be subjected to a single heating step or by multiple heating steps. The drying temperature can range from room temperature to oven temperatures in excess of that required for the coalescence of fluoropolymers. Thus, the drying temperature can be in the range of about 25° C. to about 200° C. The drying temperature can increase as the concentration of TFE increases. In some embodiments, the drying temperature is least about 125° C., 130° C., 135° C., 140° C., 145° C., or 160° C. Typically, the drying temperature is selected based on the melting temperature of a selected fluoropolymer resin. In some embodiments, fluoropolymer coated films are useful in photovoltaic modules that convert solar energy to electrical energy. A typical construction for a photovoltaic module 100 includes a thick layer of glass as a glazing material. The glass protects solar cells comprising crystalline silicon wafers and wires that are embedded in a moisture resisting plastic sealing (e.g. encapsulant) compound, and such as cross-linked ethylene vinyl acetate. Typically includes two wafers of doped silicon (p-type and n-type) in contact to form a junction with each wafer having an electrical connection. As an alternative to crystalline silicon wafers and wires, thin film solar cells can be applied from various semiconductor materials, such as CIGS (copper-indium-gallium-selenide), CTS (cadmium-tellurium-sulfide), a-Si (amorphous silicon) and others on a carrier sheet which is also jacketed on both sides with encapsulant materials. The encapsulant is bonded to a backsheet. Fluoropolymer coated films are useful for such backsheet. In one embodiment, the polymeric substrate film is a polyester, and in a more specific embodiment, a polyester selected from the group consisting of polyethylene terephthalate, polyethylene naphthalate and a coextrudate of polyethylene terephthalate/polyethylene naphthalate. In one embodiment the polymeric substrate is a heat sealable film such as 3M™ Scotchpak™ Heat Sealable Polyester Film that comprises PET combined with olefinic polymers such as ethylene vinyl acetate (EVA). Polyester provides electrical insulation and moisture barrier properties, and is an economical component of the backsheet. The dried fluoropolymer coating described herein forms the outer layer that is typically exposed to the environment. In another embodiment, (not shown) both surfaces of the polymeric substrate film are coated with fluoropolymer creating a sandwich of polyester between two layers of coating of fluoropolymer. In some embodiments, the fluoropolymer layer may be bonded directly to the (e.g. EVA) encapsulant. Fluoropolymer films provide excellent strength, weather resistance, UV resistance, and moisture barrier properties to the backsheet. In one embodiment, the fluoropolymer film comprises primer layer, formed from a dried fluoropolymer coating composition as described herein, present between the polymeric substrate film and the dried fluoropolymer coating surface layer. In this embodiment, both the primer layer and the outer layer can be formed from an aqueous fluoropolymer coating as described herein. Alternatively, the outer layer can be formed from a thermoplastic fluoropolymer that is extruded molten onto the primer layer or heat laminated to the primer layer. In this embodiment, the fluoropolymer layer disposed on the primer lacks fluoropolymer particles. In both embodiments, the outer layer typically has a higher concentration of inorganic nanoparticles as compared to the primer layer. A (e.g. polymeric) film having a coating, as described herein, is surmised to have other uses. In another embodiment, the article comprises a substrate, such as a polymeric film, comprising the dried aqueous fluoropolymer coating. Primer layer, formed from the dried fluoropolymer coating composition as described herein, may be present between the polymeric substrate film and a fluoropolymer film layer. In some embodiments, the fluoropolymer film layer comprises a dried fluoropolymer coating, as described herein. Objects and advantages of this invention are further illustrated by the following examples, but the particular materials and amounts thereof recited in these examples, as well as other conditions and details, should not be construed to unduly limit this invention. These examples are merely for illustrative purposes only and are not meant to be limiting on the scope of the appended claims. Unless otherwise noted, all parts, percentages, ratios, etc., in the examples and in the remainder of the specification are by weight. Unless otherwise noted, all chemicals were obtained or are available from, chemical suppliers such as Aldrich Chemical Company, Milwaukee, Wis.
“2 nm SiO2” was silica nanoparticle dispersion, particle size 2 nm, obtained from Nalco Company, Naperville, Ill., under trade designation “NALCO 8699”. “5 nm SiO2” was silica nanoparticle dispersion, particle size 5 nm, obtained from Nalco Company, Naperville, Ill., under trade designation “NALCO 2326”. “20 nm SiO2” was silica nanoparticle dispersion, particle size 20 nm, obtained from Nalco Company, Naperville, Ill., under trade designation “NALCO 1050”. “75 nm SiO2” was silica nanoparticle dispersion, particle size 75 nm, obtained from Nalco Company, Naperville, Ill., under trade designation “NALCO 2329”. “Clay” available from Southern Clay Product Inc., Gonzales, Tex., under the trade designation “LAPRD” “THV340Z” was a (50 wt.-% solids) dispersion of a polymer of tetrafluoroethylene, hexafluoropropylene and vinylidene fluoride obtained from 3M Company, St. Paul, Minn. under trade designation “3M™ DYNEON™ FLUOROPLASTIC THV 340Z”, reported to have an average particle size of 120 nm, a pH of 9.5, and a melting point of 145° C.
“Lumiflon ZBF500-1” is a water-based fluoropolymer (fluoroethylene vinyl ether copolymer obtained from Dalian Zhenbang Co. (Dalian, China). “FPN” is an aqueous dispersion of a fluoropolymer (having 32.2 mole % of PMVE, 1.3 mol % of nitrile vinyl ether (NVE) and 66.5 mol % TFE) that can be prepared as described in Example 1 of U.S. Pat. No. 6,943,228. The fluoropolymer has a melting point of 309° C. and the melt flow index (372° C./5 kg) of 2 g/10 min. “FP1” was a dispersion (35 wt.-% solids) of a fluoropolymer that can be prepared in a similar manner as FPN utilizing the following amounts of monomers: 44 mol % tetrafluoroethylene, 19 mol % hexafluoropropylene and 37 mol % vinylidene fluoride. The fluoropolymer has a melting point of 115° C. and the melt flow index (265° C./5 kg) of 10 g/10 min. “FP2” was a dispersion (50 wt. %) of a fluoropolymer that can be prepared in a similar manner as FPN utilizing the following amounts of monomers: 48 mol % of tetrafluoroethylene, 20 mole % hexafluoropropylene and 22 mol % vinylidene fluoride. The fluoropolymer has a melting point of 165° C. and the melt flow index (265° C./5 kg) is 9 g/10 min. A-18—ionic surfactant, obtained from Stepan Company, Northfield, Ill. under the trade designation “POLYSTEP A-18”. Arkema PVDF—a fluoropolymer latex available from Arkema under the trade designation “Kynar Aquatec® ARC latex”. 3-glycidoxypropyltrimethoxysilane was obtained from Alfa-Aesar, Ward Hill, Mass. CX-100 is a polyfunctional aziridine liquid reported to have an equivalent weight of 156 obtained from Royal DSM N.V., Harleen, Netherlands under trade designation “CX-100”. Diazirdine was di(2-propyleniminoethyl)sulfone as described in U.S. Pat. No. 3,235,544. 2-methyl aziridine obtained from Sigma Aldrich Company, St. Louise, Minn. Into a 100 mL round bottle flask was placed acryloxypropyl trimethoxysilane (48.8 g, 0.209 mole) and a magnetic stir bar. To the stirred acryloxypropyl trimethoxysilane was added 2-methyl aziridine (90% pure, 14.0 g, 0.23 mole). After addition, the reaction solution was heated at 60° C. for 20 hours. The excess 2-methyl aziridine was removed to give a viscous liquid. Proton NMR was used to analyze the product and confirmed the desired product structure. The coated samples about 5 cm×5 cm in size on 50 micrometer-thick PET substrates prepared as described below were cut (cross hatched) on their coated side to form about 16 squares using a sharp razor blade. The cut samples were immersed in water at 50° C. overnight. Then the coated samples were removed from water, wiped and an adhesive tape with an aluminum backing available from 3M under the trade designation “(3M-425-DWB)” was stuck on their coated side. The number of squares removed from the coated side of PET substrate with the adhesive tape was recorded to indicate the adhesion quality of the coatings to the PET substrate. The surfaces of the coated samples were scratched with an ASTM standard pencil of varying hardness (i.e., 2H, 3H, and so on). The tracks of pencil scratch on the coatings were then examined by a microscope. If the PET was not scratched but was compressed to form the pencil grooves, and the coating is undamaged the test was repeated with another pencil with higher hardness. The highest pencil hardness that the coatings could handle without damage was determined and reported. Coated samples were measured for initial transmission and haze prior to testing to provide a baseline value for the test. Coated samples were cut into circles using a 4.075 inch diameter circle cutter (#1817238) and a rolling press setup. The circular samples and were then mounted on a 5155 Dual Rotary Platform Abraser (serial no: 20101135). The rotary abrasion test was conducted with CS10F Abrasion Pads under 500 g weight for 100 cycles at a rate of 60 cycles per minute. The abrasion pads were treated with the grinding stones to ensure they are refreshed before each test sample per standard operation procedure. The samples were then tested for Transmission and Haze after calibrating the transmittance machine for the Rotary Abrasion test area. Transmission and Haze data were recorded and then compared with the initial values. Samples were also checked under a microscope at 50× magnification to determine if the coating has been removed from the substrate. The previously described silica nanoparticle dispersions were diluted with water and 3-glycidoxypropyl trimethoxysilane was slowly added at various amounts to obtain 100% coverage of the nanoparticles. After addition, the solutions were stirred for 48 hrs at room temperature. The solutions were clear or slightly hazy. All the silica nanoparticles and clay utilized in the examples were unmodified (i.e. did not contain a surface treatment) unless indicated otherwise. Into a 250 ml glass jar was placed 6 g clay and 150 ml of D.I. water. The solution was stirred at room temperature until the clay was completely dispersed into water. To the dispersed solution was added 1.5 g of 3-glycidoxypropyl trimethoxysilane. The solution was stirred at room temperature overnight. All the examples that include clay contained this epoxy modified clay. The described fluoropolymer latex dispersions were diluted to 20 wt-% solids or 40 wt-% solids with deionized water. When present, (unmodified or modified) silica nanoparticles were added to the fluoropolymer latex dispersion at the weight ratio of solids described in the tables. Concentrated aqueous ammonium hydroxide was added to adjust the pH value of the mixed dispersion to 9.5-10.0. Subsequently, the described aziridine compounds were added at the amount indicated. The mixed dispersions were coated on PET (wiped with IPA prior to coating) with a #12 Meyer bar unless indicated otherwise. The coated films were heated at 150-160° C. for 10 minutes unless indicated otherwise. The solutions of the following tables were coated on PET (cleaned by wiping with IPA) with a #12 Meyer bar. The coated PET was heated at 160° C. for 5 minutes. The wt-% solids can be calculated by dividing a weight ratio in grams by the total weight and multiplying by 100%. For example, In Ex. 15, the wt-% solids of fluoropolymer (THV340) is 10/(10 + 0.36 + 0.05 + 0.03) × 100% = 96 wt-%. The following examples demonstrate that good adhesion can be obtained with a variety of surface modified and unmodified nanoparticles ranging in size from 5 to 75 nm. In the following table the surface modified nanoparticle include the designation “M-”. The formulations in the following table contained 3 wt.-% CX-100 polyaziridine and 3 wt.-% aziridine alkoxysilane. The remaining 94% contained the weight ratio of fluoropolymer and silica nanoparticles as set forth in the table. In the following table the surface modified nanoparticle include the designation “M-”. The coated samples were dried at 120-160° C. for 2-5 minutes. at least one aziridine compound comprising at least two aziridine groups. 2. The fluoropolymer coating composition of claim 1 wherein the aqueous liquid medium is basic. 3. The fluoropolymer coating composition of claim 1 further comprising inorganic oxide nanoparticles. 4. The fluoropolymer coating composition of claim 3 wherein the inorganic oxide nanoparticles comprise silica, clay, or a mixture thereof. 5. The fluoropolymer coating composition of claim 3 wherein the inorganic oxide nanoparticles have an average particle size of less than 100 nm. Y ranges from 2 to 6. 7. The fluoropolymer coating composition of claim 6 wherein R-L is a residue of a multi(meth)acrylate compound. 8. The fluoropolymer coating composition of claim 6 wherein the aziridine compound is free of hydrolyzable groups. monomeric units derived from HFP. 10. The fluoropolymer coating composition of claim 1 wherein the fluoropolymer comprises at least 50 mole-% of monmeric units derived from VF, VDF or a combination. 11. The fluoropolymer coating composition of claim 1 wherein the fluoropolymer comprises at least 50 mole-% of monomeric units derived from TFE and repeat units derived from alkyl vinyl ether. 12. The fluoropolymer coating composition of claim 1 wherein the fluoropolymer comprises at least 45 mole-% of monomeric units derived from TFE and monomeric units derived from perfluoroalkyl vinyl ether. 13. The fluoropolymer coating of claim 1 further comprising surfactants, pigments including TiO2, and light stabilizers. 14. A coated substrate comprising a substrate wherein a surface of the coated substrate comprises a dried coating composition according to claim 1. 15. The coated substrate of claim 14 wherein the substrate in is an inorganic or organic substrate. wherein the fluoropolymer is cured as a result of reaction between the reactive functionality of the fluoropolymer and at least one aziridine compound comprising at least two aziridine groups. 17. The photovoltaic module of claim 16 wherein the coating is a primer having a thickness ranging from 0.1 mils to 1 mil. 18. The photovoltaic module of claim 16 wherein a fluoropolymer layer lacking fluoropolymer particles is disposed on the primer. 19. The photovoltaic module of claim 16 wherein the coating is a backside coating that is exposed on the outer surface layer having a thickness ranging from 0.2 to 10 mils. 20. The fluoropolymer coating composition of claim 1 wherein the coating composition comprising non-fluorinated polymer binder in an amount no greater than 5 wt. %. 3M, Dyneon, Fluoroplastic THV 340Z, Dyneon Product Catalogue, 1 pg. 3M, Dyneon, Fluoroplastic THV 340Z, Preliminary Technical Information, 2 pgs. Database CA [Online] Chemical Abstracts Service, Columbus, Ohio, US; Imoto, Katsuhiko et al: "Room temperature-curable water-based fluoropolymer coating compositions", retrieved from STN Database accession No. 2005:100331 O ; & JP 2005 248157 A (Daikin IND Ltd) Sep. 15, 2005 (Sep. 15, 2005). Database WPI, Week 200134, Thomson Scientific, London, GB; AN 2001-321263 XP002734103, & JP 2001 072819 A (Daikin Kogyo KK) Mar. 21, 2001 (Mar. 21, 2001). Database WPI, Week 201355, Thomson Scientific, London, GB; AN 2012-K51279, XP002734102, & KR 2012 0086226 A (Toray Aovanceo Materials Korea Inc) Aug. 2, 2012 (Aug. 2, 2012). Database WPI, Week 201355, Thomson Scientific, London, GB; AN 2012-K51284, XP002734101, & KR 2012 0086225 A (Toray Aovanceo Materials Korea Inc), Aug. 2, 2012 (Aug. 8, 2012). International Search Report for PCT International Application No. PCT/CN2013/086680, dated Aug. 8, 2014, 4pgs. Kynar, A Water-Based Fluoropolymer Platform, 2011, 4 pgs. Milker, "New Generation of Multifunctional Crosslinkers", Pressure Sensitive Tape Council, pp. 53-80. Nalco, General Product Information, Nalco Chemical Company, 1999, 1 pg. Parker, "Water-Based FEVE Resin Technology for Performance Improvement in Architectural Coatings", AGC Chemicals, 2012, 39 pgs. WPI / THOMSON Week 200134, 21 March 2001 Derwent World Patents Index; XP002734103, MITSUHATA H; TSUDA N: "Aqueous dispersion composition, useful for preparing coating materials, comprises aqueous dispersion of fluorocarbon resin and crosslinking agent"
WPI / THOMSON Week 201355, 2 August 2012 Derwent World Patents Index; XP002734101, HWAN L S; IK H C; PIL K S; SU S B; WON S S: "Antistatic coating composition used for manufacturing antistatic polyester film, comprises specified amount of conductive polymer resin, water-dispersible polyurethane resin, crosslinking resin, fluorine resin, metal oxides and surfactant"
WPI / THOMSON Week 201355, 2 August 2012 Derwent World Patents Index; XP002734102, HWANG C I; KIM S P; LEE S H; SEO B S; SEO S W: "Coating composition for manufacturing antistatic polyester film, comprises surfactant, water dispersible polyurethane resin, cross-linker resin, fluorine resin, conductive polymer resin and polar solvent"
XAMA 7, Polyfunctional Aziridine, 2004, 2pgs, XP055160058.